Creation Art Effects is an After Effects template and all-in-one art studio. It's jam-packed with effects for turning your video footage into living, moving works of art - in almost any medium you can think of! Watch the Demo Video for Creation Art Effects. 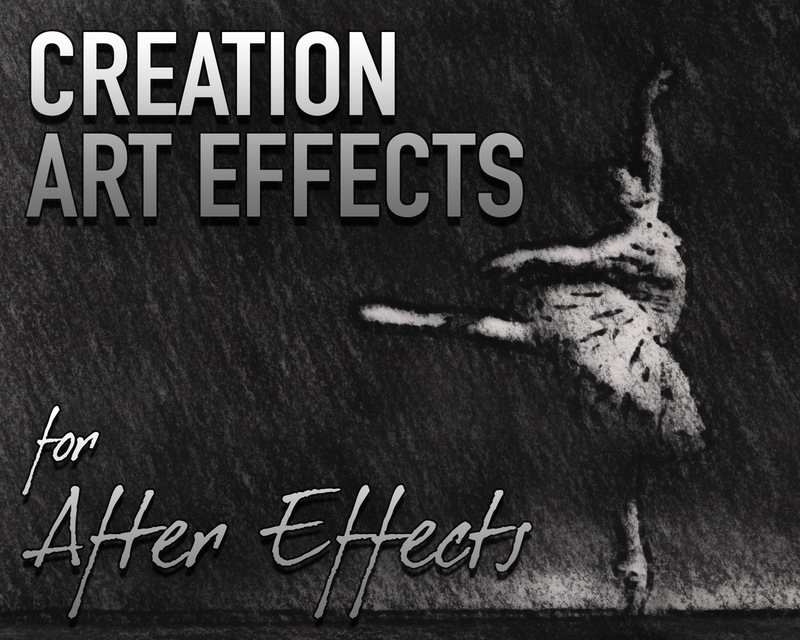 Creation Art Effects - For After Effects CS5 and up. This template is an all-in-one art studio, jam-packed with effects for turning your footage into living, moving works of art - in almost any medium you can think of. There are approximately 50 unique preset looks (or “art effects”), and you can explore unlimited combinations of art mediums, art surfaces, and styles by mixing and matching elements, and by using the numerous customization controls. Words fall short when describing artwork, but you can see in the demo video that these effects are completely realistic because they use authentic photo textures (over 500 high-resolution images are included). The textures change on every frame, which means you can apply the effects to images or text, as well as footage, and the resulting effect will be moving and animated. Textures include paper surfaces, canvases, pencil strokes, paint textures, fabric patterns, and more. Four pencil drawing effects with outline and shading, four pencil outline-only effects, three pen drawing styles, nine oil paint effects, including a Claude Monet effect and two Vincent Van Gogh effects, two watercolor paint effects, four flip book effects, custom ink bleeds and blots, 8-bit animation, building bricks (like LEGO’s), chalk on chalkboard, marker on whiteboard, two charcoal effects, claymation, colored pencil, crayon, graffiti, three halftone effects (CMYK, dots, and stripes), paper cutouts (like South Park), pastels, pop art, and two typography art effects. The effects cover all kinds of styles like classical, grunge, quick sketch, collage, detailed, abstract, and more. This enormous template has endless applications and is sure to be a valuable tool in your arsenal over and over again!